Here's what will be bouncing, flying, dancing, and rolling down Seventh Avenue next Thursday morning. Thanksgiving is just a week away, and that means the 85th Annual Thanksgiving Day Parade is too. Almost as much a national tradition as turkey is the same day, the parade combines the best of tradition (hello Santa, Rockettes) and the new and wondrous each year. Here's a peek at what will come down Seventh Avenue this year, courtesy of a special event at the Macy's Parade Studio (yes, there is such a thing) in Moonachie, N.J. on Tuesday. Director Tim Burton, known for his twisted and visually-inspired films like "Edward Scissorhands," "A Nightmare Before Christmas," "Sleepy Hollow," and "Alice in Wonderland," has already had his original art featured in the Museum of Modern Art, but now it will float high above the city streets. Burton has created an original balloon -- a stitched-together ragdoll-like creature -- called B. Boy especially for this year's parade. Previous artists who have created balloons include Jeff Koons, Keith Haring, and Takashi Murakami. 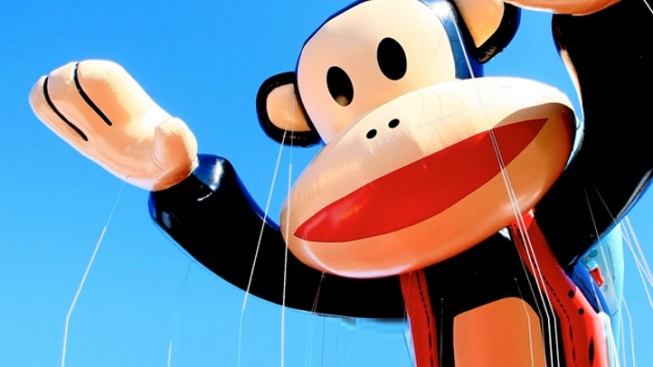 Other balloons making their 2011 debut will be "Julius," the monkey mascot of clothing designer Paul Frank, video game star Sonic the Hedgehog, and the Aflac Duck (we doubt Gilbert Gottfried will be on hand to voice him, though). Always a hallmark of the parade, the 2011 edition will the likes of Shelby Lynne, Cee Lo Green, Avril Lavigne, "Harry Potter" star Daniel Radcliffe, the cast of "Spider-Man: Turn Off the Dark" (if you're watching the parade live, keep your head up), "American Idol" winner Scotty McCreery, Mary J. Blige, Neil Diamond, and figure skater Johnny Weir. Look out for the "tricycloon." As you'd imagine, that stands for "part tricycle, part balloon." These inflated novelties will fill that niche gap between float and balloon. The tricycloons join the "balloonicles" (part balloon, part self-propelled vehicles) that debuted in 2004. This year, the Aflac Duck is an example of a ballonicle. In addition to old favorites like the Gift of Freedom (featuring a replica Statue of Liberty) and, of course, Santa's Sleigh, are all new Frozen Fall Fun float which was created in partnership with the National Hockey League (and will feature many NHL players) and the "ZHU-Niverse!" float, which marks the parade debut of the ZhuZhu Pets toy line. The 85th Annual Thanksgiving Day Parade airs live on NBC starting at 9:00 AM.